We do not treat our elderly in Maryland very well. It is a fact. You just need to pick up a newspaper to see widespread incidences of nursing home neglect, malpractice and even abuse. Choking injuries and deaths rank high on the list of awful consequences from neglected nursing homes. More and more people have to place their aging loved ones in the hands of nursing homes these days. We want great things for nursing home residents but most importantly want one thing above all: to do no harm. Pay attention to the residents. See what is there to be seen. Take reasonable precautions. When nursing homes do not do this, there are many disastrous and fatal consequences. Nursing home patients have strict dietary guidelines to ensure proper nutrition and facilitate "safe eating." Often, the elderly lack the ability to swallow certain foods due to health issues or simply advanced age. When care providers fail to enforce these guidelines or neglect to supervise patients at mealtime; there is a substantial risk of choking, which can exacerbate injuries or even cause death. If you have a loved one that suffered injuries from choking, you may have a claim for nursing home negligence. The elderly are at a higher risk of choking compared to most of the general population. This is due to a number of factors, which affect the ability to swallow. Neurological damage and complications from conditions such as stroke, Parkinson's, Alzheimer's, and cancer can all lead to muscular problems. Considering the amount of different muscles that go into chewing, aging in general can also substantially affect a person's ability to chew. Given the elevated risk, it is vital that nursing homes take notice of any patients with difficulties and supervise them accordingly. A significant portion of patients in nursing homes are on ventilators or other devices that assist with breathing. The choking risk is especially great in these scenarios because any obstruction of a breathing tube can result in injury. Meals do not present the only risk here; improper ventilator maintenance and blockages can pose a danger to the elderly. Proper supervision is important, but physicians should evaluate patients with swallowing difficulties to fully appreciate the scope of the issue upon arrival to a nursing home. By doing this, physicians can recommend "safe-eating" options to nursing home staff members. All of this information should be noted in the patient's records so each care provider that comes in contact with the patient knows of any and all restrictions on food and medicine. The best way to prevent injury from a choking episode is, of course, to make sure patients are not put at risk of choking in the first place. The human body has two main tubes that begin at the throat and continue into the body cavity. One of which, the trachea (or windpipe), carries oxygen in and out of the lungs through the throat and mouth. The second tube, the esophagus, carries food from the throat to the stomach. Choking occurs when food or some other obstruction enters the trachea as opposed to the esophagus. The brain needs oxygen to survive, so when an obstruction prevents air from entering the body, brain damage and even death can occur. When this does happen, a quick response is needed to clear the obstruction and to prevent injury or death. 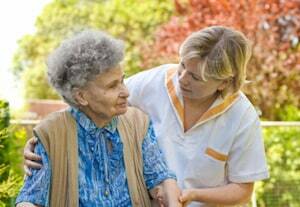 When Are Nursing Homes Liable? Many choking accidents are preventable. For instance, choking can stem from a care provider failing to adhere to the patient's dietary guidelines. Additionally, some patients may require supervision while eating, so a failure to do so only increases the chance of injury should a patient suffer a choking episode. As is often the case, the blame cannot be placed on one individual. Nursing homes are to blame for under staffing or placing unqualified staff members in positions of great responsibility. When that is the case, it is important to hold the institution liable to ensure that others will not suffer the same fate. Below are some nursing home choking accident settlements and verdicts in injury and wrongful death cases. This is a very specific case to bring, so these verdicts and settlements are from all over the country. Why so few verdicts? Is this a rare occurrence? No. Nursing home facilities keep a tight lid on information on these cases by settling them long before they ever go to trial and including confidentiality clauses. Our law firm, Miller & Zois, has never settled a nursing home case without confidentiality. So there is only so much information on there that we can provide. Still, the following verdicts provide a lens into the value these types of nursing home negligence claims. Do these cases alone help you predict the value of your case? No. These cases - really every civil case - is just too complicated and involve too many factors to predict the value of each claim; without baking in a ton of intangible factors. Even then, predicting what a jury will do can be a crap shoot. Still, it is nice to digest the following settlements to have some context for the value of these types of nursing home claims. Along with other resources, these verdict and settlements can inform the likely settlement value or likely verdict range of your claim if it is successful. 2012, Pennsylvania: $400,000 Settlement - An elderly woman is a resident at a nursing home. One day staff members find her in bed without a pulse. She is transferred to a hospital, where they determine that the woman choked and suffered a hypoxic brain injury. She is immediately placed on life support but eventually is taken off a few days later. Her estate sues the nursing home, alleging violations of the Pennsylvania Older Adult Protective Services Act. Specifically, they allege violations that the nursing home neglected their duty to care for a vulnerable person. Prior to trial, the parties settled for $400,000. 2011, Michigan: $2,350,000 Verdict - After suffering a stroke, a man is admitted to a nursing home. He has a very specific diet because of a swallowing deficiency. He also requires strict supervision during meals. One day, he is mistakenly served hard meatballs, causing him to choke. None of the nurses know how to administer CPR, leaving the man without oxygen for 14 minutes. When EMTs arrive, they remove the meatball, but the man passes away at the hospital shortly after. His family sues the nursing home, claiming that they did not have adequate staff supervising meals and should not have served the meatball to the man. The nursing home argues that he actually stole the meatball from another resident's tray. The jury awarded $2,350,000 to the man's estate. 2011, Virginia: $300,000 Settlement - After suffering several medical complications, a woman was admitted to a nursing home. She was placed on a soft-food diet given her history of stroke. While eating a meatball under the supervision of care providers, she becomes unresponsive. None of the staff realize that she is choking and make no effort to administer the Heimlich maneuver. An ambulance comes, and when EMTs attempt to intubate the woman, they find the meatball obstructing her airway. By then she suffered a severe brain injury and was acidotic. After her death, her estate sues the nursing home, claiming that they failed to administer proper care and failed to follow her dietary guidelines. The parties reached a settlement of $300,000 at mediation. 2010, Tennessee: $1,200,000 Settlement - A resident of a local nursing home is found unresponsive after dinner. Staff tries to provide CPR, but an ambulance is called. EMTs remove pieces of a pear from the woman's throat, which was blocking her airway. She is transported to the hospital, but passes away several hours later. Her estate sues the nursing home claiming that it was dangerously understaffed, likely resulting in the woman's accident. They also claim that the elderly woman was given food that did not conform to her dietary guidelines. The parties were scheduled to arbitrate and settled for $1,200,000. 2009, Massachusetts: $300,000 Settlement - An elderly woman is placed on a strict diet at a nursing home, due to her swallowing issues. After eating food from her approved food list, she is found unresponsive, in her wheelchair. Care providers wheel her back into her room, where resuscitation is performed. After being transported to the hospital, care providers remove a piece of sandwich from her throat and pronounce her dead upon arrival to the hospital. Her estate sues, claiming that the nursing home should not have left the woman unattended during her meal. Prior to trial, the parties settle for $300,000. Our attorneys handle nursing home negligence cases including ones like these. If you or a loved one has been injured as a result of a nursing home's negligence, it is up to you to hold them accountable. Our attorneys have the experience and skill to help you do just that. If you believe that you have a claim, contact our office at 800-553-8082 or visit our website for a free consultation.